Hoppin’ Frog Brewery is a small, hands-on brewery in Akron, Ohio making very flavorful beers in the most flavorful styles. We brew the highest quality beer with an uncompromising focus on detail, from the ingredient selection to the brewing process. After nearly 7 years in business, our highly anticipated Tasting Room opened June 21st 2013, offering fun, adventurous dishes that change with the seasons, and a vast array of the highest quality Hoppin’ Frog beers. With an experienced and enthusiastic staff in the kitchen, the focus is on freshness and vibrant flavors by using superior-quality meats and cheeses to make 12 to 15 tasty offerings, including appetizers, sandwiches, and entrees. And, with 24 taps plus a special Rare Beer List at the bar, guests can order 5, 8 or 16-ounce glasses of many Hoppin’ Frog beers on tap. 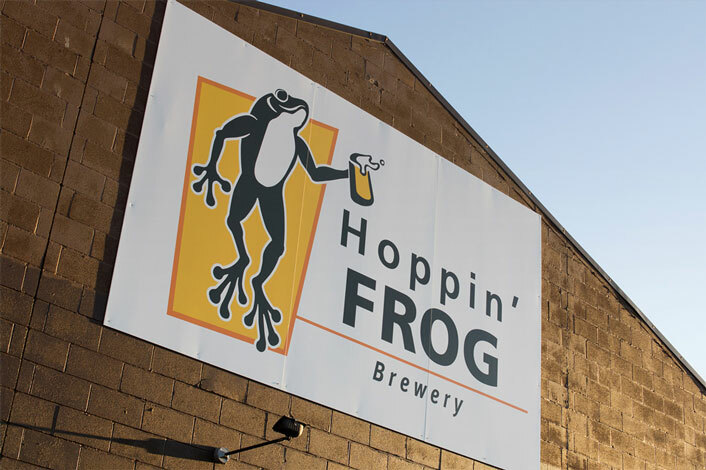 Hoppin’ Frog is the concept of owner and established brewmaster Fred Karm, who has designed and produced 22 award winning beers at the Great American Beer Festival and World Beer Cup, the two most prestigious contests in the world. Hoppin’ Frog Brewery was established in 2006, and now distributes beer in 22 states and 38 foreign countries. 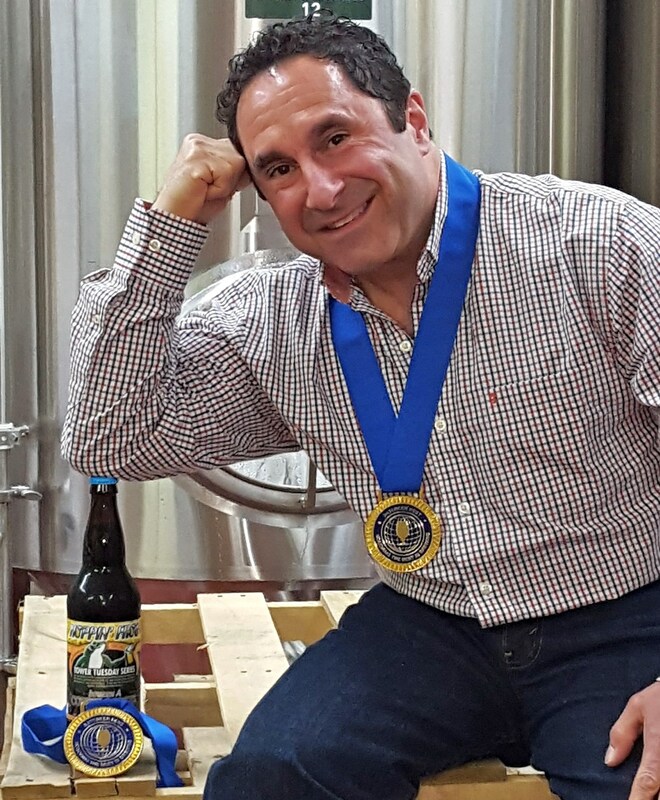 Fred is a life-long Akron, Ohio resident, a graduate of the University Of Akron and has been a brewer of specialty beers since 1994. Hoppy Hour Every Monday from 5 pm - 7 pm! Enjoy Hoppin’ Frog drafts at $1.00 off any pint, and $0.50 off ½ pints. Hoppy Hour Every Tuesday from 3 pm - 7 pm! Enjoy Hoppin’ Frog drafts at $1.00 off any pint, and $0.50 off ½ pints. HOPPIN' FROG PINTS and BARREL-AGED 1/2-PINTS only $5 from 3:00 to 7:00 p.m.!!! Stop and meet the men behind Hoppin' Frog beer, ask the questions you have always wanted to ask, and try some tasty Hoppin' Frog beers. We are excited to announce a very tasty, very limited bottle release of our Blueberry Turbo Shandy Citrus Ale in 22-oz bottles starting at 11:00 a.m.!!! $1 OFF Hoppin' Frog Pints and $.50 OFF Hoppin' Frog 1/2-Pints from 3:00 - 7:00 p.m.
Special Saturday Hoppy Hour: Enjoy our great hoppy hour deals from 12 pm to 3 pm! Enjoy Hoppin’ Frog drafts at $1 off any pint, and $.50 off ½ pints. Would you like to have a party in our Tasting Room? Send us an email at thetastingroom@hoppinfrog.com; please include a description of the event, the date you are requesting, and your contact information. We would love to host your special events!